*RECAP* 2016 MOMs Run 5k... Join Me For 2017?!? Do you have one of those can't miss local races? I have a few, but one of the tops is definitely the M.O.Ms Run 5k on Mother's Day in Somerville (May 8, 2016). The wife and I have run in this race every year since moving back to Boston from Chicago. Now I wanted to make sure 2016 would be no different. Since I was simultaneously training for a 39.3 challenge (in May I took on a half marathon on a Saturday and a marathon on the Sunday), I needed to get some extra miles in. My coach Greg told me to run 1 warmup mile and 0.9 cooldown mile to round my day out at 5 miles. Since we live about a 7-min drive away from the race we still didn't have to leave the house before 9am for the 10am 5k start. We easily parked in Davis Square and headed over to the VFW in Davis to pick up our bibs and t-shirts. We could've walked back to the car, but Molly was there once again with Mobile Locker Co so we stored our stuff in a locker. Oohhh Bib #9! Damn I was one of the first to register. Haha. Once we had put our stuff away, I kissed the wife and headed out for my 1 mile warm-up. I really just did a couple of laps around the blocks surrounding the race start. My legs were a little tired from the previous day's 9-miler, but working on running on tired legs was the goal of the day! Especially with some inclines thrown in. I knew it wasn't a PR day, but I still lined up in my normal place in the Start chute. After the National Anthem played, I kissed the wife again as she headed towards the back of the Start chute to get ready for her own run. Since there are a lot of families that take part in the race, some folks want to be near the front of the pack even if their pace would be more comfortable more towards the middle or back of the pack. This leads to more bobbing and weaving at the beginning of the race. I wish folks would line up appropriately. More so for everyone's safety. I hate the worry over potentially being tripped or bumping into someone while trying to cautiously pass. But to each their own and I squeeze through with a smile and an "Excuse Me." As you make sure your way through the first 0.2 miles, the course starts to open up as you run up Highland Avenue. This is a deceiving street as it is a long and gradual incline. After making our way down Highland Ave towards the Somerville High School/Library, it is time to take a right on Vinal Avenue and we get a glimpse of our first downhill of the race... and a water stop! There was another incline! ;) This is a tough one mentally since I know the area so well. I was focused on passing one light post at a time. I wanted to stop. I wanted to sit on the side of the road. I wanted to walk. But this is exactly where I needed to dig deep and keep putting one foot in front of the other. Plus I KNEW there was a downhill coming up for the last 0.5 mile. I made sure to leave enough in the tank for a Finish Line leap. The volunteers were handing out carnations at the Finish, but I didn't take one as I am not a mom. With time to spare before the wife would cross the Finish Line, I knocked out my 0.9-mile cool-down run. And during that is when the rain started. Thankfully it wasn't too hard. With my 5 miles done, it was time to grab a beer and wait for the wife to finish. Now another great thing about this race is the after party. Delicious food donated by the local restaurants from Davis Square and the Harpoon Beer. I love catching up with friends after the race. This is my great friend George. Always fun battling with George out on any race course. And look at his choice of PRO Compression socks! ;) Great minds. 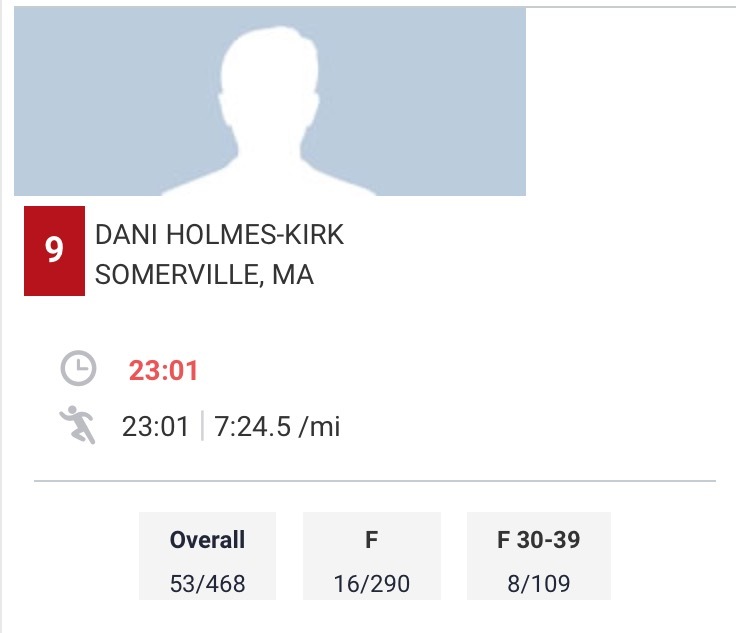 While I was disappointed in my time, I did realize it was my second-fastest time on the course. Overall, the race and extra miles were amazing. The course is challenging. Volunteers were enthusiastic. The 5k walkers (who start before the runners) were awesome at cheering on the runners and vice versa. Plus the after party is off the hook. Mmmmm BBQ and ice cream and beer and cake... Now I am salivating. Interested in joining me for the MOMs Run 5k in 2017? In the past 15 years, M.O.M.’s Run has raised over $180,000 benefiting the Claudia Adams Barr Program in Innovative Basic Cancer Research at Dana-Farber Cancer Institute. We owe this success to the thousands of runners, countless volunteers, and generous sponsors who have partaken over the years. Thank you!